With all these reports of the whitefish bite being ON this year, why not learn a few things about other types of whitefish here in Montana? The mountain whitefish is known as “trash fish” to some anglers, while other anglers love the fight they put up on the line. They taste pretty darn good barbecued, too! They are considered a nuisance by some anglers, but are sought after by others. Whitefish provide forage for larger trout. Despite their abundance, whitefish don’t directly compete with trout because they use different habitats within a stream. Their pointed snout and small round mouth makes them efficient at vacuuming invertebrates from the substrate while trout tend to feed more on drifting insects. 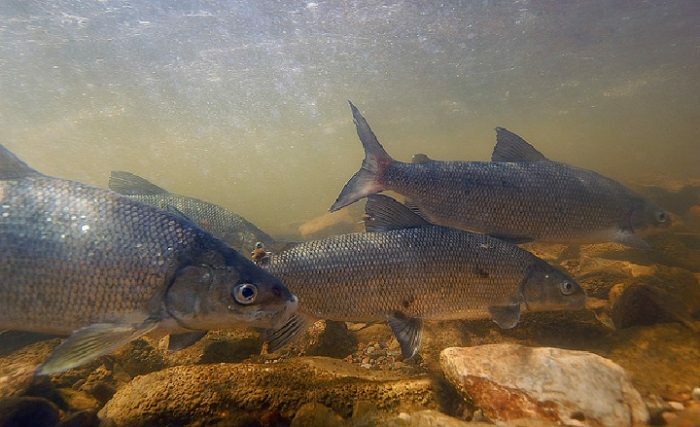 Mountain whitefish often congregate in large schools on their fall-spawning runs to broadcast their adhesive eggs over gravel bars in tributary streams. The typical mountain whitefish is a cylindrical 10-16 inch fish, but they can reach a weight of 5 pounds in Montana. In the Madison River, mountain whitefish densities reach an incredible 15,000 fish per mile. Mountain whitefish outnumber trout 10 to one in rivers such as the Kootenai, Yellow­stone, and Flathead. Mountain whitefish are also excellent table fare when cooked, smoked, or pickled. Whitefish feed on aquatic insects on the stream bottom and usually occupy the lower stretches of a pool. Trout usually feed higher in the water column of a river and generally occupy the upper ends of pools.